Says Marco Rubio is proposing a new $1 trillion "welfare program" in tax credits and "$1 trillion in new military spending." By Tom Kertscher on Thursday, November 12th, 2015 at 11:39 a.m. The word conservative was uttered 18 times during the Fox Business News Republican presidential debate on Nov. 10, 2015. Paul called himself the only fiscal conservative among the eight candidates on stage -- and made a point to contrast himself with U.S. Sen. Marco Rubio of Florida, in one of the more contentious exchanges of the night. Rubio had just defended his proposal to increase a child tax credit when Paul interjected. "We have to decide what is conservative and what isn't conservative. Is it fiscally conservative to have a trillion-dollar expenditure? We're not talking about giving people back their tax money. He's talking about giving people money they didn't pay. It's a welfare transfer payment," Paul said of Rubio’s tax credit plan. "So, here's what we have. Is it conservative to have $1 trillion in transfer payments -- a new welfare program that's a refundable tax credit? Add that to Marco's plan for $1 trillion in new military spending, and you get something that looks, to me, not very conservative." Defending the tax credit and his defense spending proposals, Rubio said "the family is the most important institution in society and "the world is a stronger and a better place when the United States is the strongest military power in the world." But is Rubio proposing a new $1 trillion "welfare program" and "$1 trillion in new military spending"? And $1 trillion over what period of time? Rubio’s tax plan includes creating a new, partially refundable child tax credit of up to $2,500 per child. It is meant to offset income and payroll taxes and is considerably larger than the $1,000 credit that is currently available. Refundable tax credits help people at the lower end of the income scale, in that people who are too poor to pay any income tax can get money back from the government. Paul’s campaign referred us to a March 2015 analysis by the nonpartisan Tax Foundation of a tax plan proposed in the Senate by Rubio and U.S. Sen. Mike Lee, R-Utah. That analysis estimated the credit would result in a loss of tax revenue of about $170 billion per year. That’s the equivalent of $1.7 trillion over 10 years -- 10 years being a common time frame for federal budget planning. But it’s worth noting that Paul didn’t say 10 years in making his claim. We’ll note that, unlike the original Rubio-Lee plan, Rubio as a candidate is proposing that the credit would be phased out at higher income levels -- beginning at $150,000 for an individual and $300,000 for a family. That would mean the lost revenue would be something less than $1.7 trillion over 10 years, but still well above $1 trillion, said Kyle Pomerleau, director of federal projects at the Tax Foundation, a free market-oriented think tank. That’s because relatively few people at the higher incomes have children and would be eligible for the tax credits, he told us. In other words, the tax credit is expensive, Pomerlau said, because "it’s large and nearly universal for families." The Tax Policy Center, a joint venture of the Urban Institute and Brookings Institution, also did an estimate of the original tax credit proposal and came up with a figure similar to that of the Tax Foundation -- an estimated loss of nearly $1.58 trillion in tax revenue over 10 years. Roberton Williams, a fellow at the Tax Policy Center, told us the center hasn't analyzed Rubio's current proposal. But he said a loss of $1 trillion in tax revenue over 10 years is a fair estimate. Paul’s characterization of Rubio’s tax credit as welfare is a stretch, however. Eleanor May, Paul’s campaign spokeswoman, said "giving people a refundable credit -- meaning, giving them more than they paid" is a "welfare transfer payment from one group of people to another." But as our colleagues at PunditFact noted, even the most expansive definition of welfare -- including the cash program called Temporary Assistance for Needy Families (formerly known as Aid to Families with Dependent Children), traditional food stamps, Medicaid and the food program called Women, Infants and Children -- doesn’t include tax credits. Rubio, whose campaign did not respond to our requests for this article, noted in the debate that everyone who works pays the payroll tax. Rubio has backed more defense spending since at least March 2015, when he and U.S. Sen. Tom Cotton, R-Ark., introduced a budget amendment to increase the Pentagon’s budget. At the time, Rubio argued that adjusted for inflation, defense spending had declined by 21 percent since 2010 -- a claim PolitiFact National rated Mostly True. Rubio’s amendment proposed restoring defense spending levels to what had been proposed in the spring of 2011, for fiscal 2012 going forward, by then-Defense Secretary Robert Gates. Gates’ proposal was prior to spending limits that were imposed by the Budget Control Act of 2011, which became law in the summer of 2011. Returning to the so-called 2012 proposed spending levels would add $1 trillion in defense spending over 10 years, Benjamin Friedman, a defense research fellow at the liberatrian Cato Institute, told us. That is also the estimate made in a July 2015 report from the nonpartisan Congressional Research Service. The morning after the Milwaukee debate, Rubio was asked in a Fox News interview: "So, where are you going to get the trillion dollars from that Rand Paul says we shouldn’t be spending?" Rubio didn’t address the figure, saying: "First of all, before we fund anything, the federal government should be fully funding national security." But he has made references to the $1 trillion cost in the past. In a September 2014 speech, Rubio said he agreed with a recommendation by the bipartisan National Defense Panel to return to the 2012-level spending, "which we are on track to be around $1 trillion short of through fiscal year 2022." And on his campaign website, Rubio says he would restore defense spending to the 2012 level, "and begin to undo the damage caused by $1 trillion in indiscriminate defense cuts." 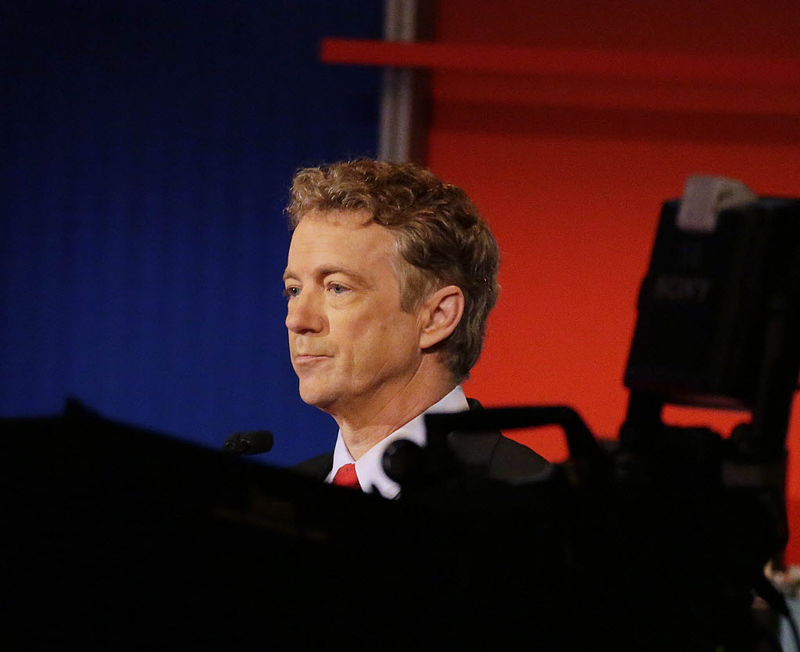 Paul said Rubio is proposing a new $1 trillion "welfare program" and "$1 trillion in new military spending." It’s estimated that over 10 years, a common time frame for federal budget planning, Rubio’s child tax credit would result in the loss of $1 trillion in tax revenue; and his plan to reverse declines in Pentagon spending would cost $1 trillion. But it’s a stretch to call the tax credit welfare and in making his claim, Paul didn’t state that the $1 trillion costs would be over 10 years. Go here for PolitiFact National's fact checks on statements made during the Milwaukee debate. And here for PolitiFact Wisconsin's night-of review of the debate. Published: Thursday, November 12th, 2015 at 11:39 a.m.